This week's Maitri Tune is a delightful song by Shim Shai set to a Rumi poem. This beautiful poem seems to have been one of Rumi’s personal favorite as it finds inscription on his shrine in Konya, Turkey. 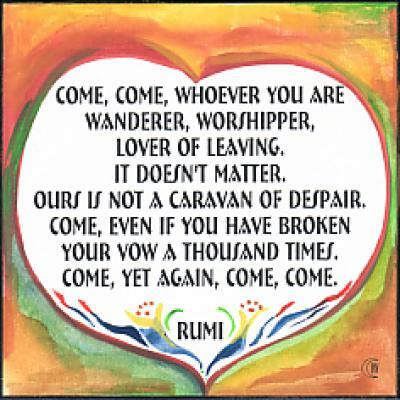 Interestingly, this poem titled "Come, come whoever you are" reminds me one of my teacher's S N Goenkaji who keeps reminding us to "start again". It doesn't matter if you have broken your vows a thousand times before!